It is on the top of Mt. 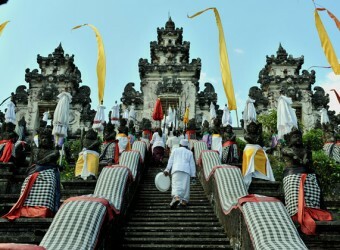 Suraya in East Bali which is 1000m height and famous as same as a popular Bali Hindu temple, Besakih Temple. Most of the visitors are all locals. Tourists rarely visit there. It is believed that the temple has full of energy and light by God, so people visit there when misfortune keeps coming. It was my first time to go to this temple and there might be a ceremony at that time. The temple was full of Hindu people. I went up the stairs and I could view Mount Agung!! It is so beautiful. I enjoyed the view til forgot the time.